for $1,079,000 with 5 bedrooms and 3 full baths, 1 half bath. This 3,128 square foot home was built in 1977 on a lot size of 0.2 Acre(s). Striking 5 bedroom 3128 square foot Westlake Village Estate with a commanding yet graceful presence that immediately transcends you into a classic Santa Barbara / Montecido -esque like setting. Romantic courtyard, enchanting entry, vaulted ceilings and large picture windows that invite the outside in. 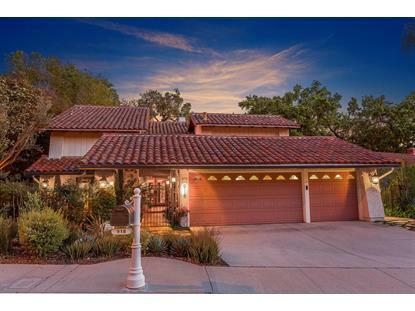 Spectacular family home with rich and plentiful landscape, pebble tech pool, spa and fire pit. Wood floors and Spanish tile highlight this captivating and highly enchanting residence. Spacious, open and highly versatile floor plan, boasting 3 bedrooms up and 2 bedrooms down. The master suite is a sanctuary of luxury with sitting area, fireplace, view of the backyard and two walk In closets. Two additional and large bedrooms upstairs (one with a view) with adjoining bathroom. Two large bedrooms downstairs one with direct access to the front courtyard. Gorgeous kitchen with caesar stone counters that opens up to a family room, dining room and additional dining area. Nicely upgraded baths. Great entertainers home, amazing outdoor area with peek a boo mountain views. Three car garage, separate indoor laundry. Village Homes Community, close to the park, tennis courts and clubhouse, walking distance to schools. All in the heart of Westlake Village.